Scotland has been a tremendous inspiration for me over the past several years. And the trip this past summer was no exception. Kilmartin Glen in Argyll has been most illuminating. Located near the west coast of Scotland, it has one of the most important concentrations of Neolithic and Bronze Age remains in Scotland. Kilmartin Glen - A Sculpture in Stones is a tone poem for orchestra based on the archeological pre-history and the recorded history of the people and the land in and around the village of Kilmartin, Argyll, Scotland. While the work is not specifically programmatic, the music is evocative of certain historic events and individuals. The “voices” of the land and its people can be heard throughout the work in the use of characteristic percussion and authentic folk melodies. There is no chronology implied in the order of the sections. Likewise, no historical connection between the three Cenéls or kindreds (Loairn, nÓengusa, nGabráin) and the pagan religious site of Temple Wood is implied. However, in the 6th century, at the time of the Cenéls, Christianity was only just beginning to be evangelized in the person of St. Columba. It is doubtful that it would have spread throughout the people in this area of Scotland. In light of this, it is possible that Temple Wood would have still been in use as a location for druid-like religious ceremonies. 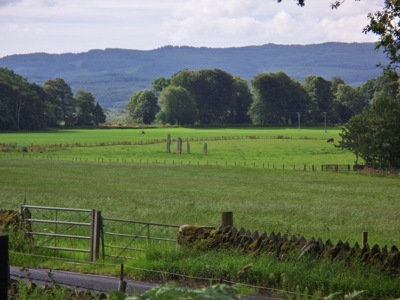 The triple-meter melody in the Temple Wood section of Kilmartin Glen is based on an authentic ancient Scottish melody which research indicates* was used as a “charm to stop a hail storm.” Melodies such as this would have been heard in prehistoric times in and around Temple Wood during religious ceremonies. Again, please go to my front page and listen to this piece. And tell your friends about it.